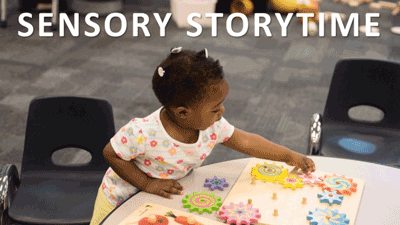 We’ve expanded Sensory Storytime to five branches: Langhorne, Levittown, Doylestown, Quakertown, and Yardley-Makefield! If your child has difficulty sitting through a traditional storytime, this inclusive program of stories, songs, and activities may be just what you are looking for. Sensory Storytimes are ideal for children who are differently abled: they may be on the autism spectrum, have sensory processing issues, or feel overwhelmed by noises or crowds. For dates and times of Sensory Storytimes, visit our Events calendar. Registration is required and is limited to 10 children and their families per session.